It's that time of year where things tend to get a little busy. 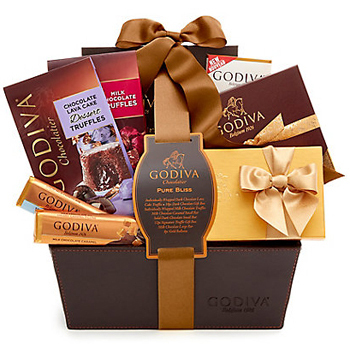 Whether it's finals, party planning, or impending holiday celebrations keeping them on their toes, this care package from Godiva is coming to the rescue. Teeming with emergency treats like a box of melt-in-your-mouth Signature Truffles (12 pcs.) a box of Assorted Chocolate with something for every mood (8 pc. ), a bag of decadent Chocolate Lava Cake Dessert Truffles (19 pcs. ), a classic Dark Chocolate Bar (1.5 oz. ), and much, much more, we've got them covered. Save the day with the Chocolate SOS basket. PLEASE BE ADVISED that delivery of this item is not possible on Mondays.